Sophomores Danny O’Regan and Matt Grzelcyk both found the back of the net in Sunday’s first round of exhibition games at USA Jr. National Team evaluation camp in Lake Placid. 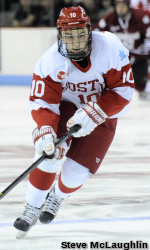 O’Regan (photo) who led BU in scoring and earned Hockey East all-Rookie honors last season, scored twice and nearly completed a hat trick in USA Blue’s 6-5 overtime loss to Finland. 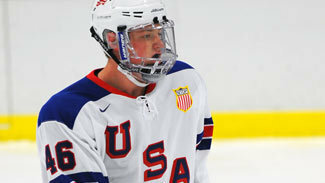 Matt Lane also showed some “good flashes” according to United States of Hockey’s Chris Peters. Matt Grzelcyk — D – I would’ve liked to have seen a little more from Grzelcyk today in terms of creation, but he was making really good decisions with the puck and never really got caught in a bad spot too much. Grzelcyk is so good at exiting the zone and finding the right outlet and his instincts in the offensive zone are advanced. I thought he was a little under his normal performance, but only by a bit. Grzelcyk is going to be an important piece of this team. Head Coach Brian Durocher, entering his ninth season behind he BU bench, announced a six member recruit class that includes two goalies, three forwards and one forward. The six freshmen will join 18 returning letter winners from last year’s squad, which won the Hockey East title and reached the NCAA championship game, while posting a 28-6-3 record. Canada's 23-member Olympic Centralization roster features four former BU skaters and one current Terrier. The former Terriers are blueliners Catherine Ward and Tara Watchorn and forwards Jenn Wakefield and Jennelle Kohanchuk. Marie-Philip Poulin, last season's BU captain as a junior, will take a year's leave from BU, to play of the Canadian National Team. In the 2010 Winter Olympics, she scored both goals in Canada's 2-0 win against the USA in the gold-medal game.